Congratulations to Whit Au (Oahu), who on May 25 was presented with the Gold Medal of the Acoustical Society of America for contributions to understanding underwater biosonar, and for service to the Acoustical Society. To celebrate, we've posted here our article on Whit and his work from the April 2008 issue of V&B. Enjoy! Most weekday mornings Whit Au (Oahu) waits on a pier for his ride to work, a Boston Whaler that carries him across crystalline blue waters toward a tiny Hawaiian island surrounded by lagoons. His office is on 29-acre Coconut Island, the same puff of land pictured in the final shot of the introduction to the 1960s TV show Gilligan’s Island, and now home to the world-class research labs and floating captive-animal pens of the Hawaii Institute of Marine Biology. Whit, chief scientist of the University of Hawaii’s Marine Mammal Research Program, studies killer whales, humpback whales, shrimp and, especially, dolphins. Unlike most of his colleagues and graduate students, he isn’t a zoologist or a biologist. He’s a self-described “non-huggy” scientist who doesn’t swim with or pet his research subjects. (“There are trainers for that,” he points out.) Whit is an electrical engineer by training, one of the first to enter this field, and he’s an expert on dolphin sonar or echolocation. Dolphins are known for their keen intelligence (though there is no way to prove the common notion that they are among the most intelligent of animals, Whit says) and for their remarkable communications capabilities. They make two noises primarily: several-secondlong whistles (audible to the human ear) and millisecond, high-frequency clicks (inaudible to humans). Scientists believe dolphins use whistles to communicate with one another, and bottlenose dolphins even have unique signature whistles that act like names—they’re used for calling other dolphins and for identifying themselves. Whit’s research has focused on the high-frequency clicks. In the 1950s scientists first began to suspect that dolphins used these clicks for echolocation. Just as bats use sound waves to navigate in the dark, dolphins send sound waves through dark and cluttered ocean waters, bouncing them off objects and then using the echoes to glean information about the distance and nature of the items in their environment. “Amazingly, they can tell the difference between identical-looking small aluminum and steel spheres at 50 meters or better. Spotting a 30-centimeter cod from 100 meters away is no challenge. A human swimmer, being that much larger, is probably visible to them beyond 200 meters,” Whit told Wired magazine. “They have the best sonar on this planet,” he said in another interview with National Geographic. They eclipse all instances of man-made, technological sonar. The US Navy knows this, and has trained teams of dolphins to act as underwater intelligence gatherers. In 2003, the Navy dispatched a dolphin team into the Persian Gulf to detect underwater mines and then deposit detonation packages by the mines. (The packages are not detonated until the dolphins have returned safely.) “Dolphins can not only find objects like mines buried in the seabed, but they can distinguish them from clutter such as coral, rock and manmade debris,” he says. 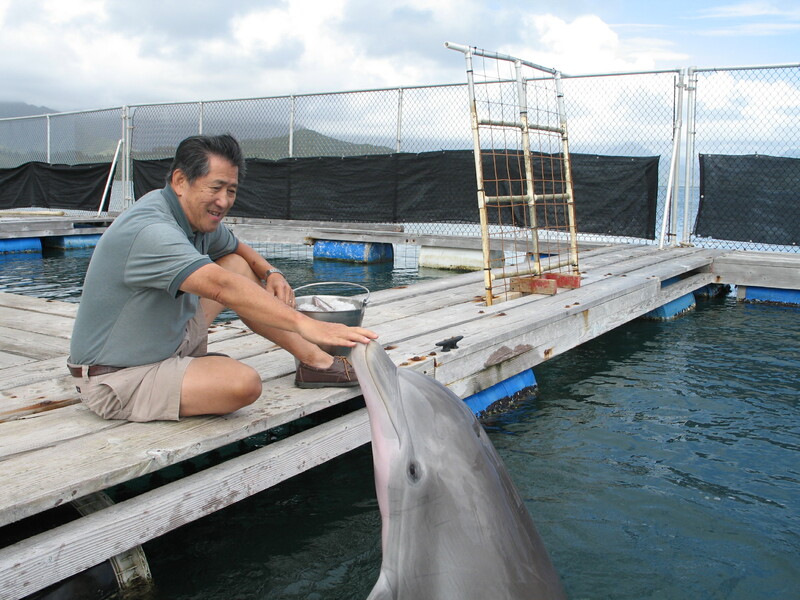 For many years, Whit designed experiments with captive dolphins. For example, he would place suction cups over dolphins’ eyes and then dangle balls in front of them at varying distances, to test and measure the strength and accuracy of their sonar. The results of his experiments are summarized in his book, The Sonar of Dolphins, published in 1993, the first modern study of the subject. Whit’s longterm goal is to learn enough about dolphin sonar to help scientists design better technological sonar. Whit (in red) with his son Wes, Wes’s wife Johanna, their son Mark and B.J. (in water). Whit never expected to work with dolphins. 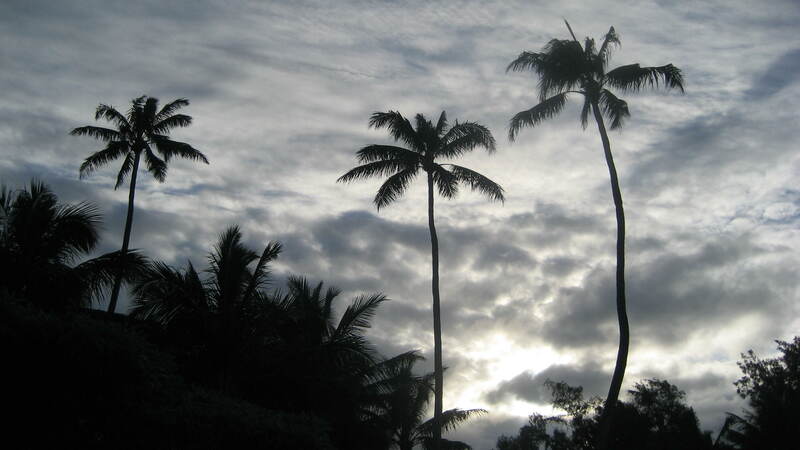 In the early 1970s he and his wife, Dorothy, came to Hawaii for two months after Whit had finished his Ph.D. Toward the end of that visit, they felt a sudden and overwhelming urge to stay, a desire both later concluded had come from the Lord. Although Whit had a research job in his field (electromagnetism) lined up in San Diego, he decided to widen his job search and look around for any kind of research. Then he encountered a man, nicknamed Crazy Evans, who worked in an artillery bunker on the Marine Corps base on Oahu. He was busy starting an underwater environmental research team, and through him, the door into the world of dolphin sonar opened. It was also around this time that Whit and Dorothy became involved with charismatic renewal, and then, in the late 1970s, with the People of Praise. In the late ’90s the Navy lab Whit had worked at for over two decades closed, and he faced a crucial decision in his career. He could either transfer to the main laboratory in San Diego or move from the federal government to the state, taking a job at a University of Hawaii research facility. 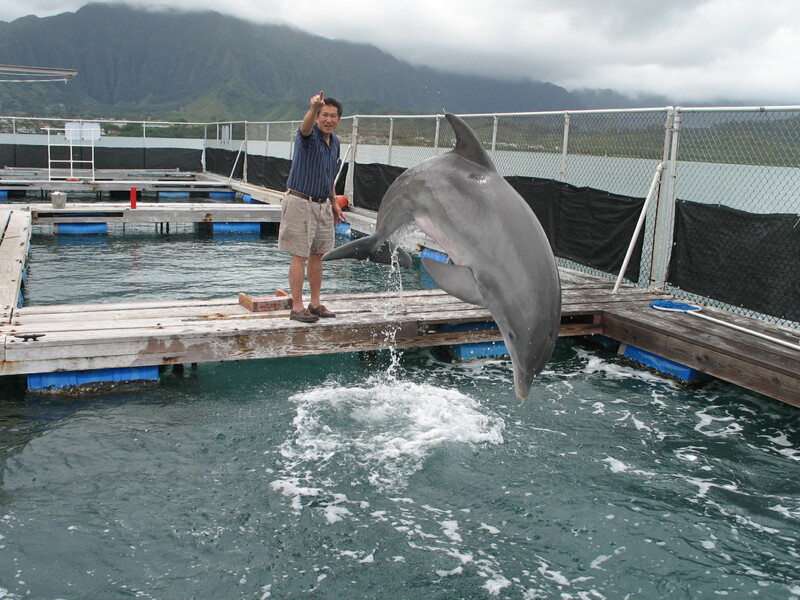 Again, the Lord moved him to stay, and Whit has been working with the Hawaii Institute of Marine Biology since 1997. His research there has broadened to include other marine animals and their interaction with their environments. He throws out some questions: Did oceanic dolphins become coastal or did coastal dolphins eventually become oceanic? What other kinds of long-term relationships do humpback whales maintain in addition to “mother and calf”? A recent experiment uncovered an answer to one question: How do spinner dolphins forage for food in the dark ocean water? Whit and his graduate students used five echosounders to track dolphins and their prey during their nightly feeding period. The complexity of what they discovered surprised them. Spinner dolphins hunt in groups of 14-26, first forming a circle to surround their prey (fish, shrimp and squid), then morphing themselves into a fast-moving three-dimensional cylinder that packs their prey in even tighter. The dolphins use whistles to communicate with one another and maintain the integrity of their enclosure. Then they take turns feeding, entering the enclosure in pairs. Whit’s own fieldwork and consulting work for other researchers takes him all over the globe: Iceland, Canada, Bahamas, New Zealand, Alaska, Netherlands, etc., and students from all over the world clamor to come to Hawaii to study under him. He repeats how blessed he is, how the Lord put him in the right place at the right time. “It’s an interesting life. The more you study certain animals, the more you appreciate what humans are—we are ‘fearfully and wonderfully made’” (Ps. 139:14). Whit feels his life as a scientist resonates with what the Lord said to Adam: Take dominion over the earth. “A scientist seeks truth in a particular field,” he says. “This is one way of taking dominion over the earth.” It’s a life calling. "Nope," he grins broadly: "this is way too much fun!"